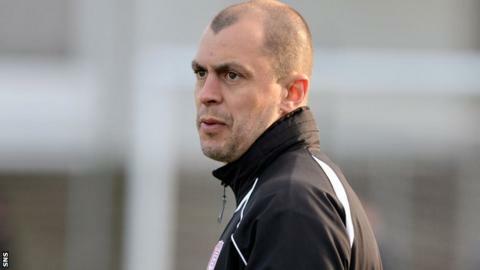 Arbroath have sacked manager Todd Lumsden after the League Two club went six games without victory. Saturday's defeat at Stirling Albion left The Red Lichties sitting eighth. "After a disappointing run of results and a poor league position, Arbroath FC have parted company with Todd Lumsden and his assistant, Steven Hislop," the club said in a statement on Sunday. "The club would like to publicly thank them for their efforts and will now actively seek a new management team." Lumsden, 38, enjoyed a lengthy playing career in Scotland, including spells with Albion Rovers, Hamilton Academical and Raith Rovers. After being dismissed as Albion Rovers manager in 2013, Lumsden coached Rangers U17 before being appointed assistant to Allan Moore at Gayfield a year later. He succeeded Moore following the latter's sacking at the end of last season.